where Pulse Period is high time plus low time. The duty cycle of a pulse is between 0 and 1 and is often expressed as a percentage. 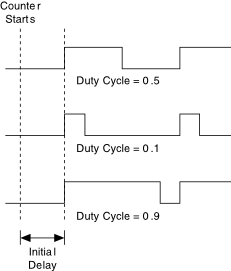 Refer to the following figure for examples of duty cycles. A pulse with a high time equal to the low time has a duty cycle of 0.5, or 50%. A duty cycle less than 50% indicates that the low time is greater than the high time, and a duty cycle greater than 50% indicates that the high time is greater than the low time.